This may seem like an odd lust object but it's not. This may seem like an unusual subject for an Object of Lust, unless you’ve been making all the liqueurs that I have been posting! I've become sick and tired of storing liqueur in Mason jars. It's not very classy. I looked high and low in different stores before I found these bottles. I looked at the Bulk Barn, Canadian Tire, WalMart, Winners, the Dollar Store, Planet Organic… You name it I was there. 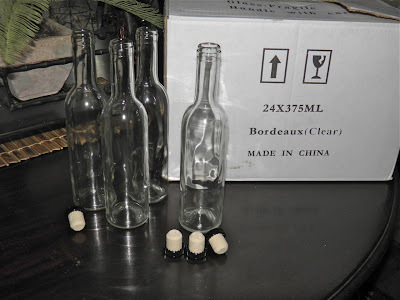 I looked anywhere locally where I thought there would be small bottles able to be used for gifts that didn't cost a lot of money. You see I didn’t want to have to pay upwards of $6.00+ per bottle. With the amount of booze I’m flavouring the number of bottles needed would quickly add up. I also looked online at the local beer and wine-making stores, but I couldn’t find anything on their web sites, if they even had a site. If you weren’t searching for a wine or beer kit you were out of luck. None mentioned selling bottles at all. I even searched on US sites that ship to Canada. 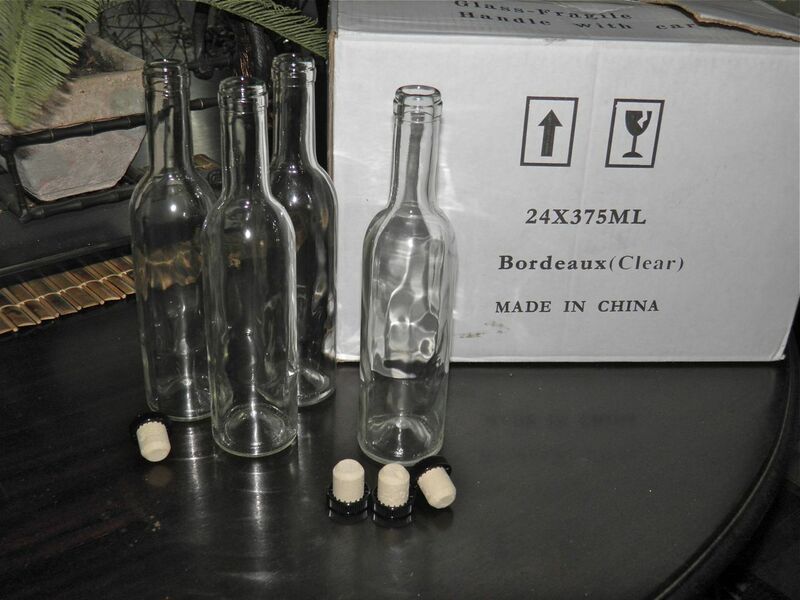 The best I found was a set of ten 250 ml bottles for about $40. They were nice, but shipping almost doubled the amount – and I had to pay customs and brokerage fees. So I was getting downcast. About $9.00 per bottle is a little rich, especially when the gift is the contents and not the container. I thought I would take a last chance (before online) and go to one of our actual local wine stores. I wasn't hopeful based on their web sites. But I found what I wanted! Before you say “why didn’t you go there first,” I’m a designer and I’ve done my fair share of web sites. If you're a retailer you list all the important things you sell. I would suggest bottles would be one. Can you say "affordable and nice"? I went to the “noble grape,” 6112 Quinpool Road (Across from the Superstore), Halifax, Nova Scotia B3L 1A3 (902) 423-2739. Their web site is http://www.noblegrape.ca/index.asp. Nobe grape is a small chain with five locations in Metro and one in Fredericton, NB. The woman behind the counter was extremely helpful. She instantly directed me (around a corner) to where they had all their bottles. Lo and behold, right in the middle were these 375 ml clear bordeaux bottles. Why anyone would put up wine in halves is a bit of a puzzler to me… but so be it. These were exactly what I wanted. Even more amazing was the price: $24.99 for—get this— two dozen!! Way less than online, and in my own backyard. 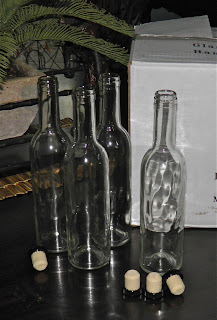 Corks (with a plastic top) were additional at 25¢. I was over the moon. Tax in, all was $34.49 ($1.46 each). 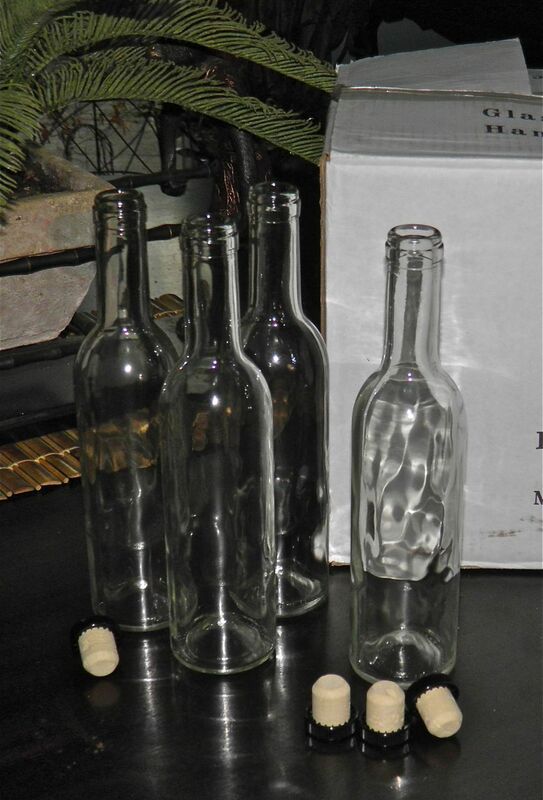 These bottles are perfect for gift giving of liqueurs. Most of my recipes will fill a little more than two bottles. A gift of a couple of liqueurs, a vinegar and perhaps a mustard or two (in small jars) would be perfect for several people on my birthday/Christmas list. By the way, don’t dismiss those wine or beer kits noble grape has on offer either, if you’re up for the challenge. I most definitely will be back!